COPENHAGEN, Feb 13 (Reuters) - What to do with the mountain of garbage a major metropolitan area produces is an age-old question. 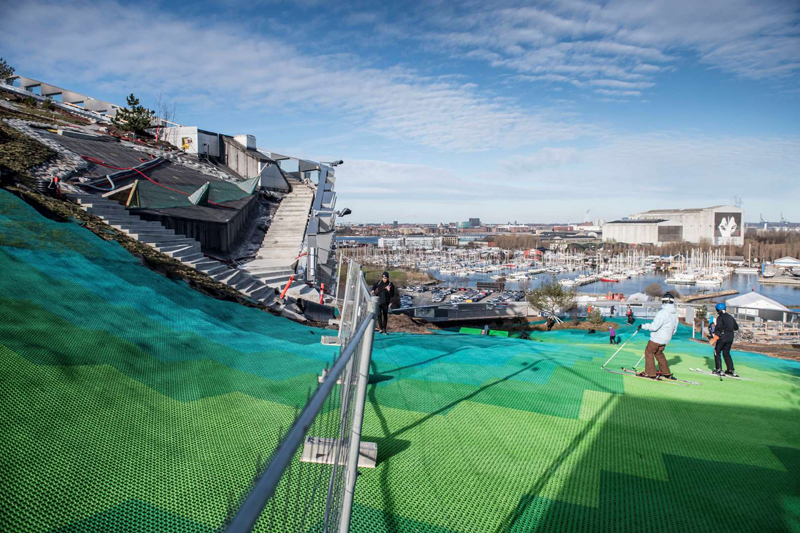 Copenhagen has come up with a brand-new answer: ski down the mountain. Well, not exactly. The waste is actually inside Copenhill, a waste-treatment plant 10 minutes from downtown Copenhagen. Its main facility is a futuristic building with a sloping roof 85 meters high that's covered in a material called neveplast. It looks just like a ski slope, except it's green. "I think everybody is surprised to start with when they look at it and it's not snow," said Christian Ingels, the director at Copenhill. "It's green dry-slope material. After one or two runs, your mind is automatically adjusting so you feel exactly like skiing." Designed by Danish architect Bjarke Ingels, the plant is an important step in Copenhagen's ambition to become the world's first carbon-neutral capital. It's an attempt to build a waste-treatment plant that local residents are happy to see come to their neighborhood. It seems to be working. "It's a fantastic experience in the middle of a city to be able to do what you do like the most," said visiting skier Pelle Hansen. "Instead of having to go six, seven, eight or ten hours to a ski destination, you can be here in ten minutes." The plant will also burn waste from around 600,000 residents and 68,000 businesses to produce electricity and district heating, will be sent back to the resident. It will also recycle some of the waste. The plant began operating in 2017, and the recreational part will open permanently this spring. The slope will open year-round. Jobs: We've got this mountain of trash - why don't we ski down it?